I used a sketch from Stuck for this layout. So pretty, great accents and i love the tone on tone title! Thanks for joining us at Stuck?! Hoe sweet, love the tone on tone title! Thanks for joining us at Stuck?! 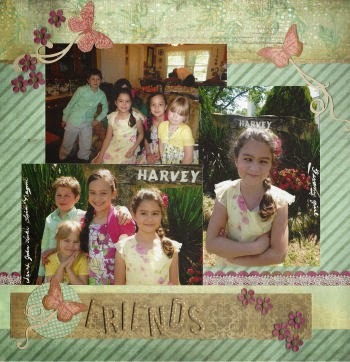 Your paper choices are perfect with your photos and such a sweet touch with the butterflies. Thanks for joining in with us at Stuck?! A lovely take on the sketch Linda, thank you for playing along with us at Stuck?! Double side step with floating butterflies.